The most popular note type created by Evernote users is a webpage. It seems that people love to save webpages in Evernote. Now Evernote is making it even easier for sites to get saved into notes with the announcement of the Evernote Site Memory Button. This is something of a departure from the historical Evernote modus operandi, where the user invokes a client application or opens up the Evernote website: the Site Memory Button is a server-side implementation, and sites that want to use it need to specifically add it. 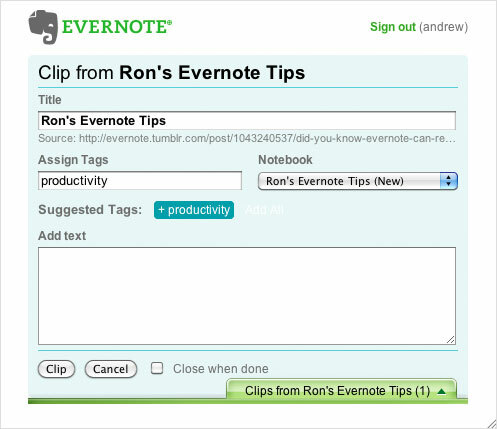 Once added, though, any Evernote user can use the button to add the page to their list of notes. The note will be pre-populated with content selected by the site owner, including title, and even have tags helpfully suggested. From a user perspective, the most interesting component is that all of the notes you’ve clipped from that domain are available right from the button. You could use this to track your favorite recipes at a foodie blog, or your favorite awkward family photos, or whatever, all from the site you’re already visiting — assuming those sites implemented the Site Memory button. From a site operator’s point of view, you’re adding a pretty handsome bit of new functionality with little effort, and there’s even some scratch to be made! Users who sign up for Evernote from your Site Memory button who later become Premium users will earn you $10. Not bad. One of the benefits of Site Memory is that is gives a blogger the ability to deliver an attractively styled note into the visitor’s account, with the attributions, links and styles that they want. From a best practices standpoint, we suggest that site owners use this capability judiciously. Adding significant amounts of extraneous content may run the risk of alienating visitors. Ultimately, this is a decision we want to leave to the site owners, since they are in the best position to understand the needs of their visitors. The reason we created Site Memory is to give publishers the ability to create a much better experience than if the visitor used one of our web clippers. Of course, if the publisher does not create a better experience, then the user is free to continue using an Evernote web clipper. So, if you don’t like the way a site uses the Site Memory button, you can keep clipping notes the old fashioned way.